Another dictionary version says: An optimistic person thinks the best possible thing will happen, and hopes for it even if it’s not likely. Someone who’s a tad too confident this way is also sometimes called optimistic. 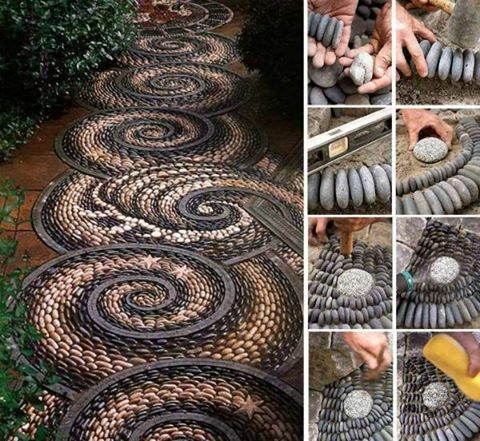 Here is a wonderful example of what one very creative person did with a “bunch of rocks.” This is a path made with stones, and although it certainly took some forethought and planning, look at what an awesome project someone came up with- basically using a bunch of rocks! I think it is just amazing and beautiful what you can do when you apply some creativity and ingenuity, ending up with a fabulous creative project like this. 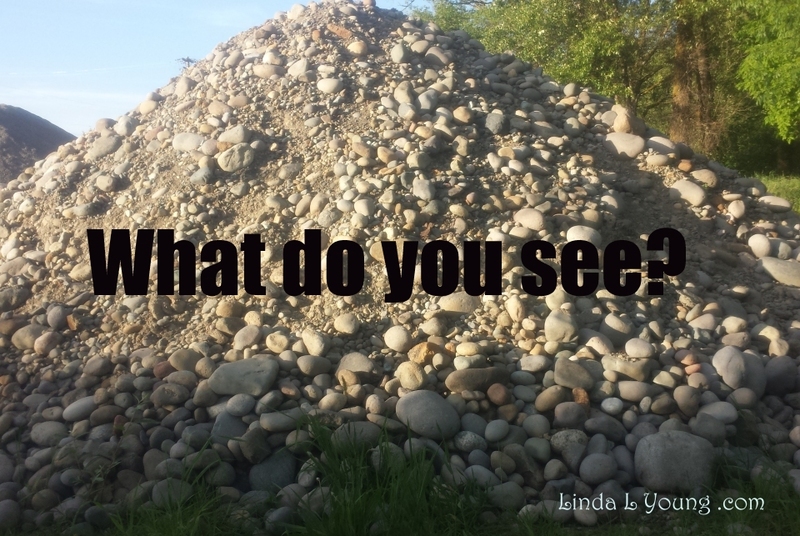 So whether you see “Obstacles” or “Opportunities” in the huge pile of rocks, at least this will give you a few things to think about and possibly a project to create on you own. Perhaps you could simplify it a little – or a lot- and just make one or two spirals. Even a circle of stones could be an enhancement to a flower garden or a point of attraction, a place of “raising your vibration” in your own back yard. This is a current photo of Mt. Rainier. It is certainly a majestic sight, with the sun setting across from it, reflecting the pale pink clouds into the sky above the mountain. Beautifully framed by the large surrounding trees. A thirty foot maple on the left and a thirty five foot cedar on the right . From this view point of the great snow covered mountain, only the top one third can be seen, and yet the majesty can still be clearly felt, as the sun sets slowly at the same time. Hundreds of distant trees outlining the horizon line, with many layers of blue green haze separating each level of growth. Intertwining logging road switchbacks running throughout each level, giving access to the forest trails in every area. People often visit mountains to meditate, raise their vibrations, and spend time thinking about their true life purpose. Sometimes this also includes setting their goals for receiving wealth and abundance. 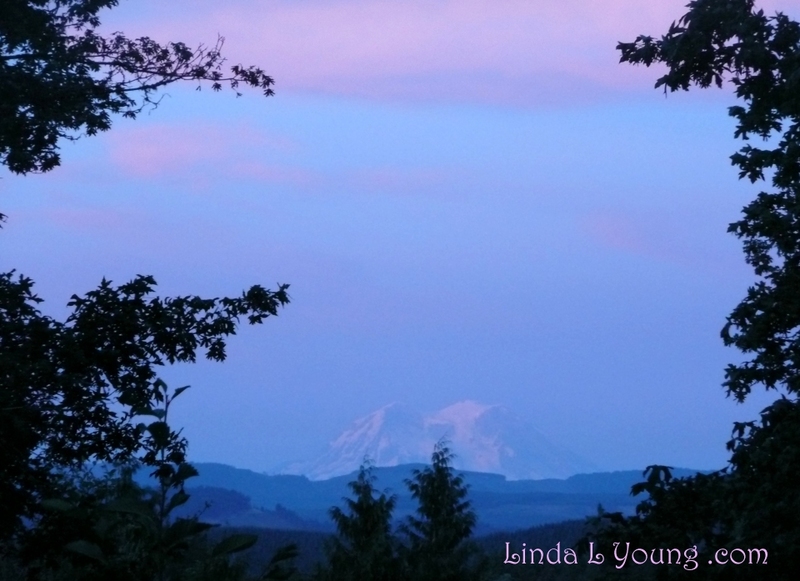 There is so much natural energy and healing in a mountain setting, that just being close by invokes the powers needed. The majestic stone structure is healing in itself, while the surrounding snow covered areas add a serenity of their own, lending a perfect setting to meditate on important issues including wealth and family. According to an internet ranking site, Ranker.com, here is a list of ten things that people think are important. This list of the most important life goals is a summary of the personal qualities that most people would include on a life goals list. These are some good life goals to strive towards and maybe some life objectives that you don’t find as relevant as other, more necessary life goals. Whatever your objective in life may be, this bucket list should help give some examples of good life goals. If you enjoy outdoor places like mountain settings, maybe you would like to take time to go there and make a list of goals for yourself using the suggestions from the list above, or adding a few more to make it your own. Whatever you do, be sure to enjoy the beauty of nature and the majesty of the mountains nearby. And yet, he shows his independence and unapproval with his mother’s want of connection. Some how he doesn’t want to take her hand. Somehow it feels like she wants to limit his playful freedom. There is a definite resistance to her, shown in his tight body language. And yet as an observer, I can see the need for connection. The desire of the mother to protect and care for her child. She knows a little more about the world around them and the possible dangers lurking nearby, so she grasps to take his hand and keep him close and safe while walking along the edge of the water. And how often does this happen with all of us? What if we realized how much our higher power, or God, cares for us and wants to show us our own highest and best, while we refuse to see the caring, and resist because we think somehow we are being limited instead of being loved. It is definitely something to think about. How easily can one misunderstand caring for restriction and how nice it is to have someone care and watch out over us in every step of our day and night. If only we are aware enough to tune in to the love around and within us. If only we can allow the love to reach us accepting it as it is. There just isn’t anything like a long walk in nature to set things straight, or to calm things down to a place of grounding. Just getting away from the boring daily routine and busy schedule allows one to look at things in a broader perspective, hopefully a calmer, more peaceful perspective. Noticing how the light shines directly on the back part of a newly formed fern. Backlighting it beautifully and separating it from the rest of the forest greens. Just noticing it’s beauty and splendor has a calming effect, bringing one to that of peacefulness and gratitude. Nothing else is demanding your attention as you stroll quietly down the path to a deeper connection with what lies ahead. More greenery, more ferns, even an occasional little squirrel scampering up and down a nearby fir tree. All is well in the confines and the continuation of nature. Everything growing and living it’s best life in harmony with everything else growing next to it. Prolific sprigs of grass, alder trees, ferns, and evergreen blackberry starts all intertwined in the depths of a wilderness trail. Nature rocks, that is for sure. Nature can also raise your vibration level to a higher degree. If you are able to connect with any of the beautiful surrounding greenery or other living things in the nearby vicinity, they can pull your vibration or feelings up to a new level. Look carefully at each living thing. Establish your connection with them feeling empowerment encompassing your being, allowing the very essence of each living plant to speak to you in it’s own way. It’s beauty lifting you higher as you allow it to fill your heart and mind, disregarding any stray thought that feels restrictive to you. The sweet smell of the evergreen trees filling your senses with familiar scents, while you walk wistfully through their branches. Deeper into the forest you wander feeling lighter and freer, your spirits ready to soar to new heights. Forgetting all the stress of the past few days, and the schedule you left far behind earlier today. Another benefit of walking in nature is the mere benefit of healthy walking. Exercise of any kind can be healthy to the body, as long as it’s approved by your primary care provider. Walking at a leisurely pace may not be as effective for raising your heart rate, or for the benefit of loosing weight, but will have an increased benefit of enjoyment and increasing your feelings of peace and harmony. Walking and enjoying nature has so many benefits – take a walk on the WILD side and see what you can find. 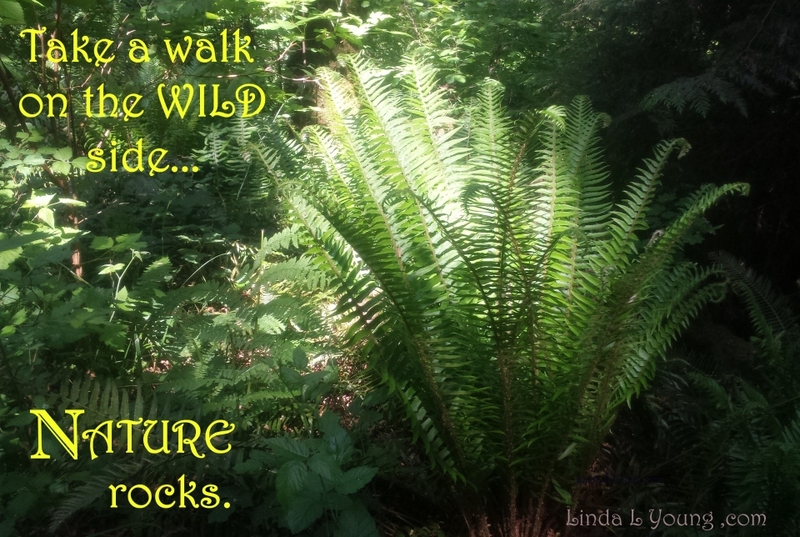 Maybe nature will ROCK your world too! Starting out today is my list of to-do’s. First I will count my blessings. 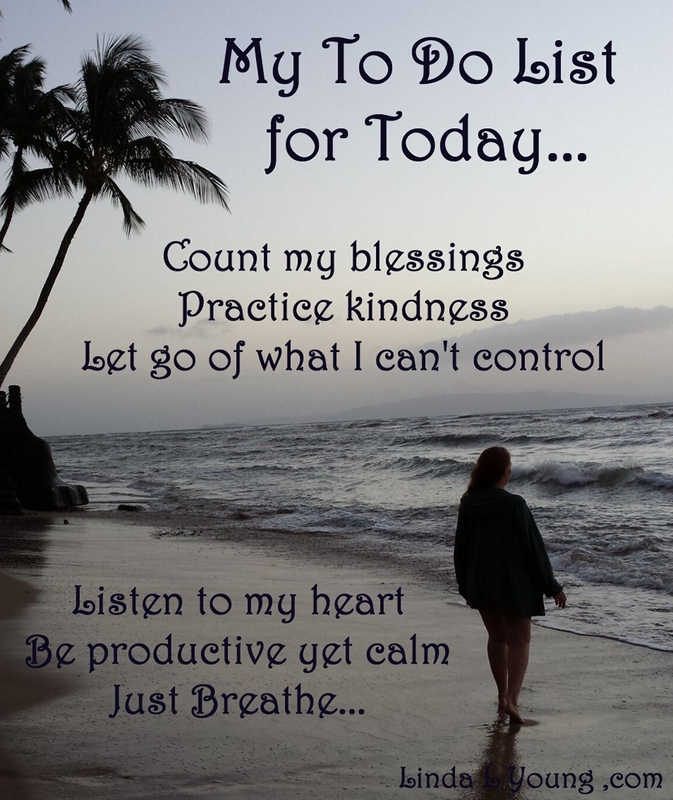 I will make a list in my head of all the things I feel blessed about. Maybe I will even write a list down on my colorful note pad. At least a few of my favorite blessings like the home I live in, the friends and loved ones in my life, the wonderful job I have, to name a few. Other favorite blessings include all the abundance I have. My collection of rocks and crystals, my pet kitty’s, all the delicious food I have to eat, and all the nice clothes I have to wear. I really am blessed, and the more I think about blessings, the more blessings I find to count. On a normal day in my life, it’s not even a challenge to practice kindness. It is just standard procedure. I try to be kind to everyone I meet and work with. As long as everything runs smoothly, it is a pretty easy task to accomplish. Kindness is merely having love and respect for your fellow human beings. It is treating people the same way that you want them to treat you. Unless someone is particularly rude and obnoxious, or many things go wrong in a row, kindness is the practice I apply, daily. On the rare occasion that things do go horribly wrong, kindness becomes more of a challenge than a practice. There are only so many things one can control in their life. Some things are just “out” of our control. For example, sometimes we want others to feel the way we want them to, maybe to like or love us more than they do. So what can we do about it? After trying for years to make everyone like me, I realized that some people just don’t like other people. They have their own likes, dislikes, and agenda. It is really not up to me to worry about how others feel anyway. It’s up to me to feel good myself, and do everything I can do to keep my own vibration positive and loving. Not that I don’t care about others, or how they feel, I just don’t let myself be a dumping ground for those who want someone to dump their garbage on. Live and learn – Right? I control only my own positive thoughts, no one else’s. I will listen to my heart today, and hopefully every day from this day forward. My heart knows my real desires and my truth. It knows where True North is no matter how many people try to sway me to another place, or another way. My heart does know my authentic truth. It is up to me to follow my heart and find a way to express myself in my highest and best way, living by the desires of my heart and the truth it holds for me. Breaking free of pre-conceived ideas, conditions and notions that don’t serve me or help me feel good. 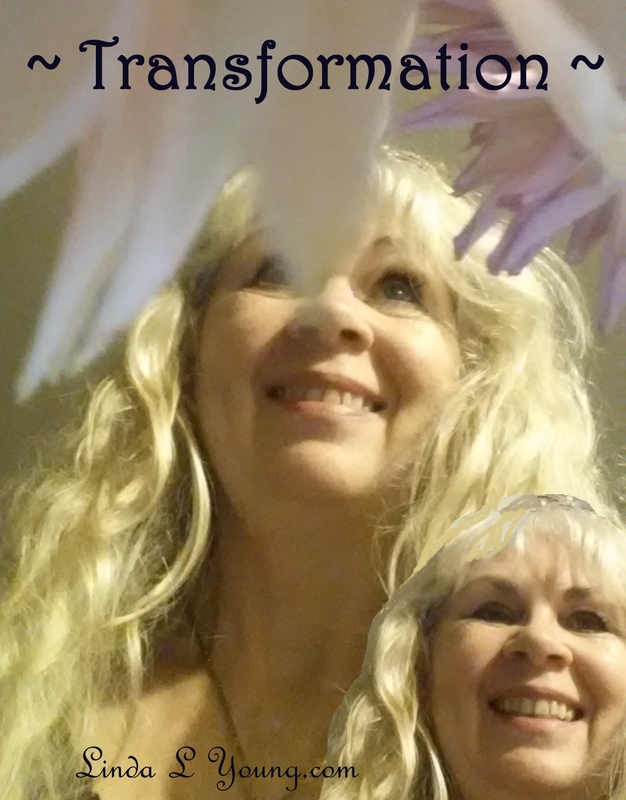 Knowing that the sensations I feel are here to help me and benefit me in my search for truth. It is up to me to be productive. I will give life my best shot. I will make a list of things I want to accomplish today, and start the first task on my list. I will continue thinking and doing things all day until I have finished as many things as I can, remaining calm and peaceful. Life can be so much fun while I work and grow and practice doing productive things all day long. It is also part of my life plan to remain calm. What good does it do to get a lot of things done, only to be upset and feeling frazzled, raising my blood pressure and giving me a headache? No, it is so much better to find a way to stay in a calm, peaceful mode of operation throughout the day, ending in such a wonderful feeling of accomplishment filled with joy and harmony. Taking time to just breathe. Taking time to stop and smell the roses so to speak. Time to meditate on, and be thankful for all the blessings I all ready have. Acknowledging the source within, expanding myself to the position of awareness, breathing in – breathing out. Enjoying each breath, one breath at a time. Realizing that breath is the fullness of life. It hinges on the vibrational response of exhilaration and happiness. Taking captive every thought and bringing it into subjection. Selectively sifting out the unproductive, negative, scenes and keeping the positive, undivided self, allowing the accuracy you are seeking on your journey. Reaching and responding to the good feeling thoughts altering your perception to that which you want. Closing the gap. Stopping the resistance, and allowing life to just flow, being happy and full of love, peace and joy. Achieving peace and vibrational harmony through allowing the stream to flow. Releasing resistance. What does it mean to live in the moment? 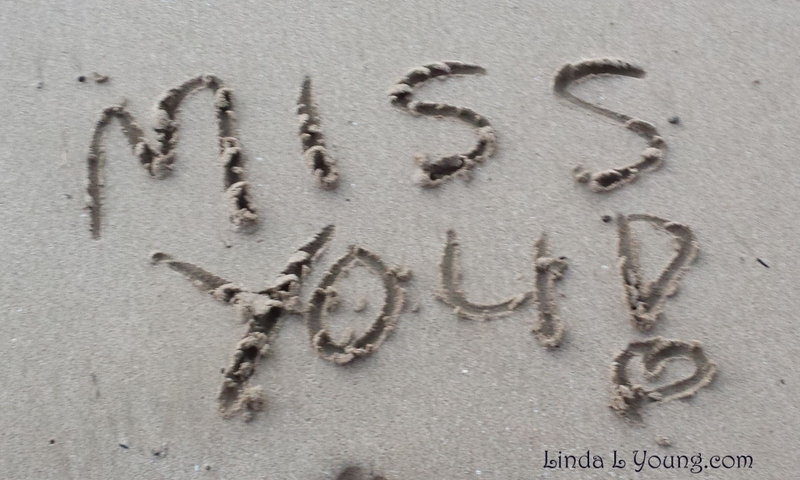 Sometimes we get so caught up in thoughts and feelings that we aren’t even present in life. We can be lost in love, or steeped in sorrow so deep that our presence is very limited. We get into emotional states that keep us hostage, swirling around and around sinking deeper and deeper into the abyss of life. Being present but not in the presence. Our thoughts are somewhere else, although our bodies are fully here. We can be so wrapped up in our thoughts that we forget about what is going on right under our noses. What about the other people in our lives? No wonder people have car accidents, when they are all wrapped up in their head. They don’t even see the red light in front of them, let alone stop at it. Meanwhile, someone else coming the other way approaches with their vehicle and while looking at their cell phone, doesn’t see your vehicle at all. Both people preoccupied with something else. Not present. So an accident occurs. Both people now have a new reality. The pain of the car crash brings them to a new realization of where they are. It brings you to a current state of being because it is so dramatic. It pulls your thinking into the “now”. Especially if the pain is great and there are immediate consequences like a loss of body limb or blood spewing profusely from somewhere it shouldn’t be. Even the possibility of someone else that is with you being hurt in some way may take your attention away from your presence in time. It would certainly stop your “day dreaming” as it were. So how do you stay in the present? It doesn’t mean that we can’t miss someone, and it doesn’t mean that we can’t love people at the same time we are also living in the now. It just means that it is important to be aware of yourself and your surroundings at all times. Be where you are in the current space and time. If you don’t feel like you are in the current moment, or can stay focused in the now, you may need to connect closer to your feelings by getting grounded. 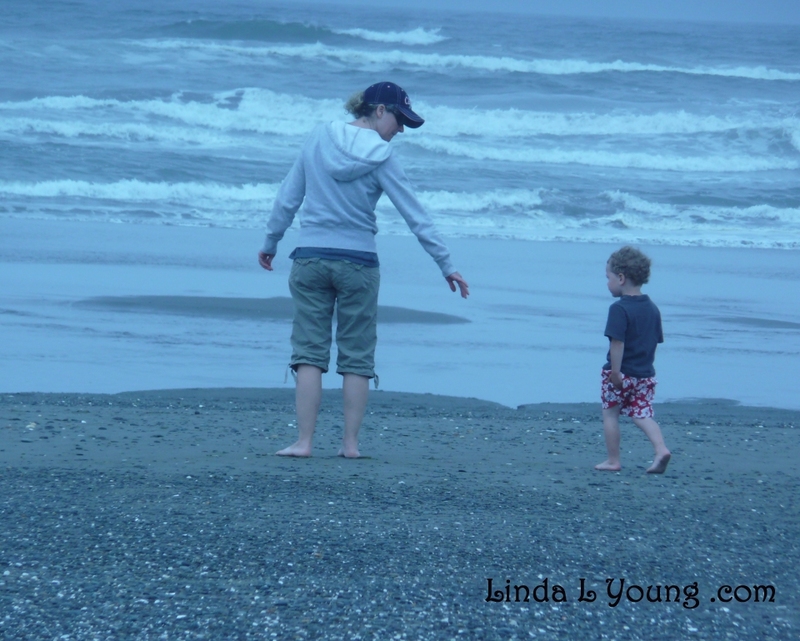 Talk therapy or massage therapy can help you get grounded. It can help you focus on specific problems or overwhelming concerns, deal with them, and bring you back to the current life you have now, not missing anyone, but simply enjoying and living in the NOW. 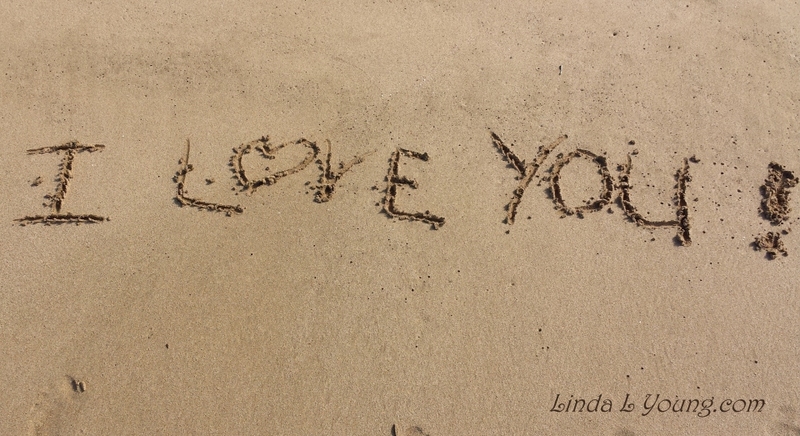 And while you are at it, try writing in the sand and let the tide wash away anything you want to get rid of. It’s your life – Live it ! Stones can be displayed in a variety of ways. 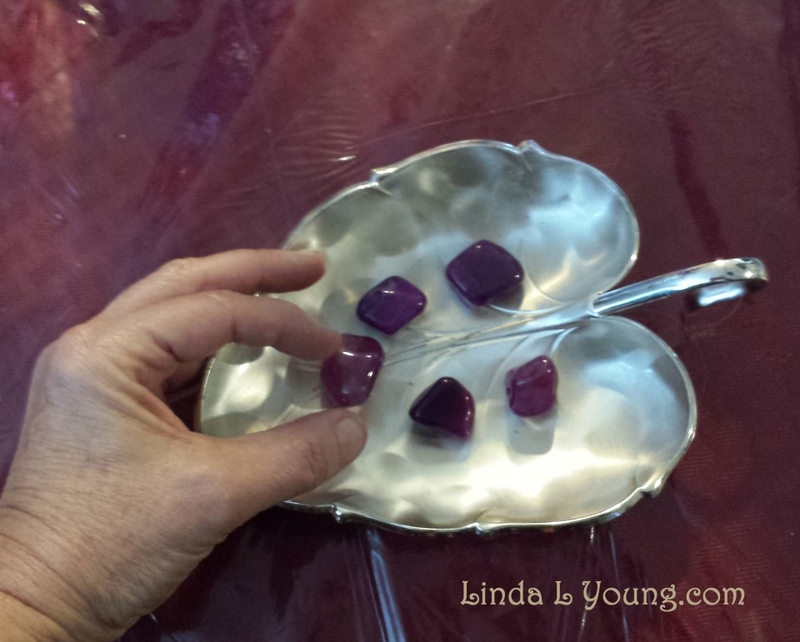 Here is a silver leaf shaped display dish that works well to show off some of my favorite purple stones. They are stones that I picked up at my local rock shop, Cove Crystals. They came from the children’s section and I’m pretty sure they are not authentic natural purple stones. They are still a form of quartz crystal though, just enhanced by man rather than by nature. In other words they are a form of clear crystal that has been dyed purple. There are also blue, pink and green enhanced stones to be found at the Cove, along with tons of other beautiful rocks and minerals. It is sometimes easier to go “rock hunting” at a rock shop then to go out foraging in the nearby fields, forests and streams. One advantage is that the weather inside the stores is always pleasant with great lighting and good energy. Easy access and rocks galore. A good way to get your “crystal fix” for the day or week is to visit a rock shop. Another way is to look for them is at garage sales and online stores listed on E bay or Craig’s list. Have you ever tried Google-ing rocks or crystal’s…It’s amazing how much information is available with the use of a computer or phone these days. As far as dying stones is concerned, rocks that accept die should be porous and be able to soak up the color as desired. There are other ways of coloring stones or making them special also. One of these ideas is to paint them using acrylic paint and a paintbrush or sponge. You can paint designs on them or stripes or faces, or make them really special by making them look like animals. Use a sponge to dab on some background color. Let it dry well before adding more layers, or detail. You can paint your name on rocks with your favorite colors. It helps if you choose well worn rocks for this. The smoother they are, the easier it is to paint on them. There are many books and videos that can help you with this and give you ideas and direction. Look in the library, craft stores or online for this information. Painting rocks is a great project to share with your friends. You can gather a few smooth stones and have a rock painting party. After the party you can share your extra finished projects with others as gifts. People love to receive personalized gifts from others. Painted rocks can be used as paperweights on an outside picnic table, or special additions to your favorite flowerbed. What is transformation? Transformation is change. We are transforming every day. As we learn, grow, and age, we transform mentally, spiritually, and physically. Transformation is not always easy…Sometimes we go through a metamorphosis that is very painful, like that of a caterpillar changing into a butterfly. It is a death of sorts to go from one stage to another. Dying to self. Dying from the old as we change and transform into the new. As we look up and search for our spirituality we are reminded of our childhood beliefs and what they mean to us. After a number of years of searching, testing, and asking, we change our initial beliefs as we grow and learn from life, and others. Seeking meaning and purpose, we advance into our new selves, confident, self assured and yet full of wonderment. Never forgetting the little child inside us, questioning the life that lies before us. Learning again as our new path emerges. We are beautifully flawed with hidden blessings as we grow into magnificent eccentricity. From the simplistic embryo or indiscernible pebble on the beach, to greatness with a place of honor and grace. Full of hope, we never give up. Although the path becomes long, windy and full of twists and turns scattered with brambles and bushes at times, we continue to prevail. Change is possible we think to ourselves. Our hearts enhanced and filled with magnanimous love, we learn to shine our lights brightly for the world to see and follow. We have arrived alive and well. We have transformed despite all odds. We have grown and become that which we were born to be. Although many times friends turn out to be foes, and things don’t always go the way you want them to. Learning life lessons is what life is about, experiencing adventures and discovering secret desires. Having as much fun as you can every day. Turning disasterous days into the best day ever is the blessed results of finding the answer to the road to successful transformation. Who is to say what your path to transformation will be. Sometimes it takes the rain along with the sun to bring out the vibrant colors of the rainbow. It takes diversity to change from a tiny, little, weak person into a strong, sufficient, successful adult. There are no short cuts to life. No one is fortunate enough to be excluded from the pain of attachment, only learning to let go solves this issue, where you can find peace of mind within yourself, no matter what circumstances are presented. Although we would like to skip the painful lessons, it just isn’t possible. Life has it’s good and bad trials, tribulations and lessons for everyone, presenting transformation possibilities for all.